In the fall, combine-harvesters move up and down the fields of grain, corn and soybean. Depending on the region, barley is threshed around the beginning of August, oats around mid August, wheat at the end of August and beginning of September, soy beans in mid September and corn in October or November. Combine-harvesters separate cereal and corn grains from the stalks. They can also shell soybeans. A large portion of these harvests may be added to the animal feed. 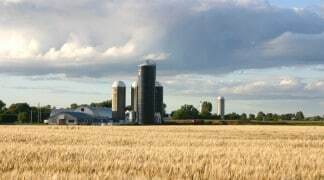 Corn and soybean grains may be taken to the dryer before they are stored so that they obtain ideal moisture content for preservation in the silo. 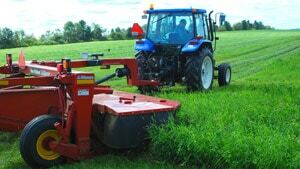 Forages may be harvested from 1 to 4 times per season depending on the weather conditions and the region. To achieve good harvests, producers must not only cut forage plants at the optimum stage of their development, but also deal with climate factors, such as the air moisture, drying index and chance of precipitation. Forages or hay commonly refer to plants that belong to two large families: legumes (whose fruit is a pod, such as alfalfa and clover) and grasses (with spikelets such as fescue, ryegrass, bromegrass hay, millet). It is recommended that legume plants be harvested at the beginning of the flowering stage and that grasses be harvested at the beginning of the heading stage. Hay is stored before it is fed to cows. Producers make silage or dry hay out of it..
Hay raking consists in turning over cut hay so that it is easier to dry (or cure) it. At the same time, this operation also makes it possible to arrange the hay into large enough windrows so that it can be gathered by the baler. Hay can be baled in small or large, round or square bales. Square bales are often stored in the loft of the stable. It is then called dry hay. Hay can also be baled into round bales that may be stored inside or outside. These bales can also be wrapped in a polyethylene film in order to protect them from moisture and avoid losses. Round bales can also be covered with watertight plastic in order to preserve their moisture. This preservation method is used for controlled fermentation, which makes it possible to preserve the hay as silage. Ensilage is another method of preserving harvests. Ensilage usually involves corn, grains or forages, which are mixtures of alfalfa and millet or clover and millet. There are also increasingly more oat and pea mixtures. The principle behind ensilage is to preserve the grain and the plant that are ground together and then put in the silo. Since plants are harvested while they are still young, or green, they contain a lot of water, which helps them ferment in the silo. 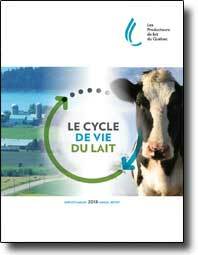 Ensilage has advantages for milk producers. First, since water is important, plants are not left to dry in the fields in order to avoid the problem of losses due to rain. Second, through the fermentation process, ensilage makes it possible to preserve important nutritive qualities. In fact, the nutritive value of forage depends on the content and type of nutritive elements (soluble and insoluble proteins, soluble sugars in the cell content, insoluble sugars in the cell walls, fat, minerals and vitamins, etc.) present in the plant. Its nutritive value can be evaluated based on the concentrations of fibre for carbohydrates, nitrogen for proteins, and phosphorus, potassium, calcium and magnesium for minerals, and the digestibility of these nutrients. This is definitely the most widely used type of silo in Quebec for ensiling hay and corn. This upright, spherical structure generally measures three of four times its diameter. Like most other types of silos, its structure allows it to maintain relatively constant moisture contents in the animal feed. Generally made out of concrete, the bunker or trench silo stores various types of forage in cells that are easy to fill and empty and can be built in a wide range of dimensions. Compared to upright silos, bunker silos have a more attractive investment cost and can be filled more rapidly. 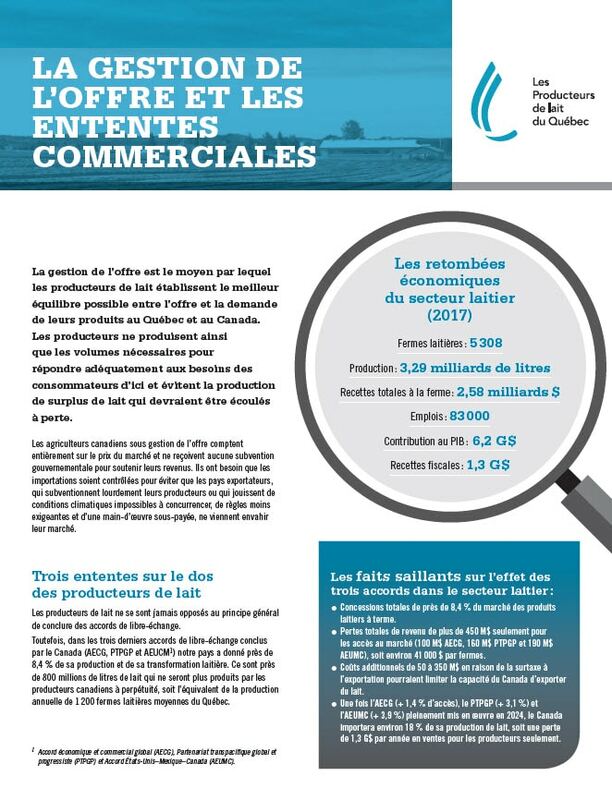 They are attractive to producers who have large volumes of silage to store. As its name suggests, this type of silo makes it possible to store forage in stacks, ideally on a concrete floor. The stacked forage is then covered with a membrane generally made out of polyethylene. The bag silo is a large plastic bag in which forage is packed using special equipment. These silos can come in a wide range of lengths. Large round or rectangular bales are ensiled to produce semi-dry silage. In contrast to other ensilage processes, the forage that is ensiled in large bales is not cut, which hampers the release of the sugars that are required for fermentation. Therefore, this silage is not preserved by fermentation, but rather by keeping it free of oxygen.